Found furniture is a great way to furnish your home on the cheap, but free furniture seldom matches your existing décor. Here’s how to fix that with a DIY reupholstering project. If you live in or near New York City like me, you may have noticed that furniture tends to appear on the street on trash night. I’m not talking about just a broken kitchen chair or a bedbug-infested mattress. I’m talking about real high-quality brand name furniture. I once found a barstool worth $1,200 in Long Island City. My father-in-law found a leather armchair and a leather couch in almost perfect condition. My house is filled with high-end furniture that I didn’t need to buy. Of course, not all my furniture is high-end. I found a very sad looking glider stool on the sidewalk one night in Brooklyn. 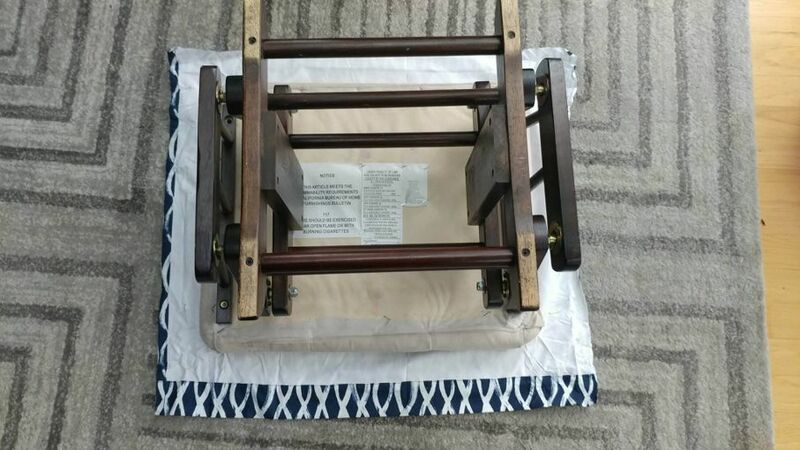 The screws were loose, and the beige cushion fabric was stained. 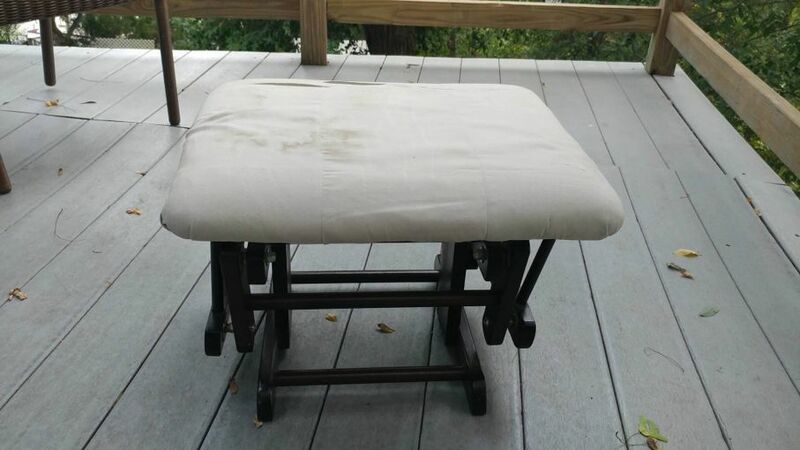 It needed some love, and I needed a footstool, so I brought it home. The first thing I had to decide was what kind of fabric I wanted. You should do this based on the design of the room your piece will live in. If you have a blue room, perhaps you want to make the piece blue. A creative idea would be to make a standout piece with fun patterned fabric. To start, go to your local fabric store and find something you like that goes with your room. I happened to be in Target with my mother when I found my fabric. It was a blue patterned curtain panel, and I simply thought it was pretty. It’s entirely your choice. My living room’s design scheme is relatively neutral, so I could get away with it. Don’t forget to be practical, however. I found a beautiful eyelet fabric that I thought would work nicely…but it was white. Not such a great idea for something we put our feet on. 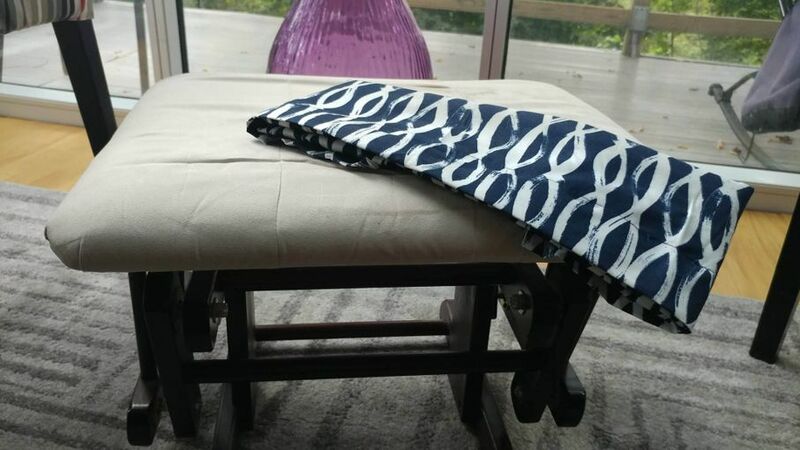 First, make sure that your fabric is the right size for your footstool. 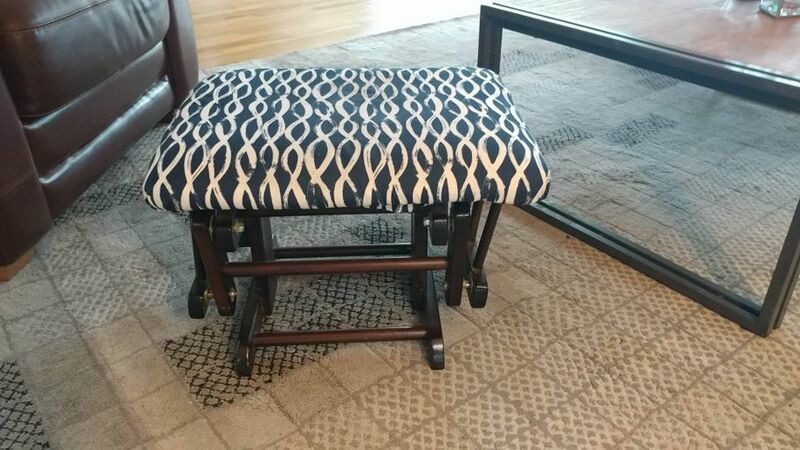 I turned my stool upside down and placed it on top of the fabric. Being that my fabric was meant to be a curtain, it was too long. 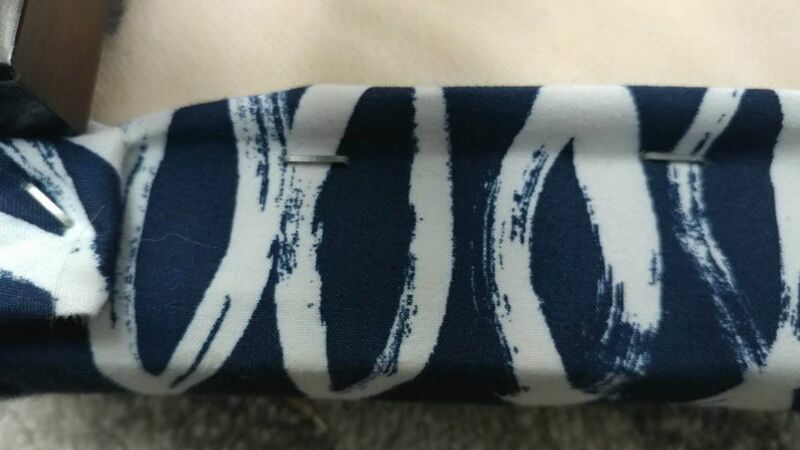 I simply snipped the ends so that the fabric was even on all sides. 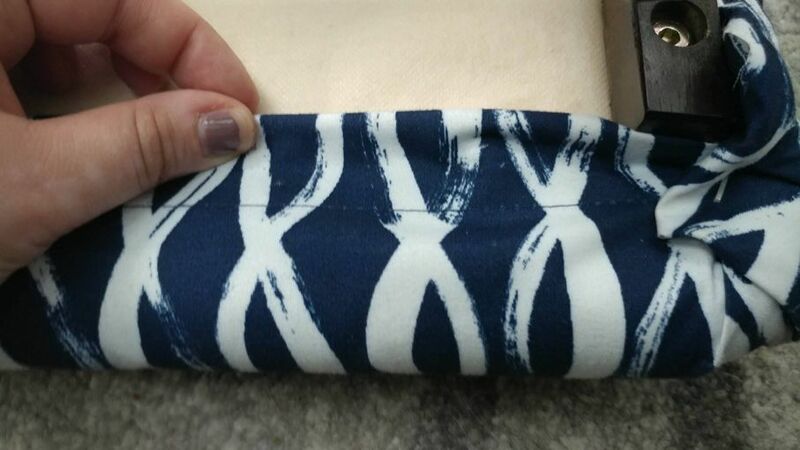 Now that your fabric is laid out, grab your fabric staple gun — not the kind intended for paper. (You can find a fabric staple gun and fabric staples at any hardware store.) Fold over the edge of the fabric just an inch or so. 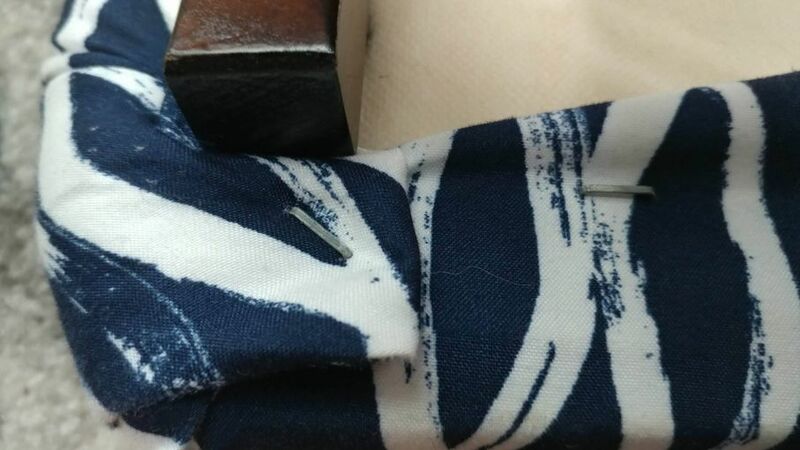 This is faking a hem. If you don’t care about what the underside of your stool looks like, skip this step. Fold up the edge of your fabric along the edge of the stool. This is where it’s important to have an equal amount of material on all sides. Otherwise, you will have problems with bunching and/or not enough fabric on one side. Now that you have your fabric in place, make a neat row of staples along the side of the stool. This part could not be easier! You might be wondering what to do when you get to the corner. This is your chance to improvise! What you need to do is to lay the fabric on the corner and make a neat little triangle fold, not unlike tucking in a hospital bed sheet. Staple this, and move on to the next row. As you go along stapling the sides, be sure that everything is even. It helps to check the top side of the footstool to be sure there are no uneven creases or folds. Finish your last corner, and voila! Your footstool could not have been easier to create. Place it by your favorite armchair, and kick back with a nice cup of tea! Next: Selecting a Sofa Style: Which One is Best for You?